Avoid endless traffic, a lengthy hunt for a free space and rushing to catch your plane by booking one of our Stansted hotels with parking. Choosing an overnight stay with parking included is the perfect choice if you have an extensive layover or are taking a long haul flight as it reduces the stress and hassle of travelling. 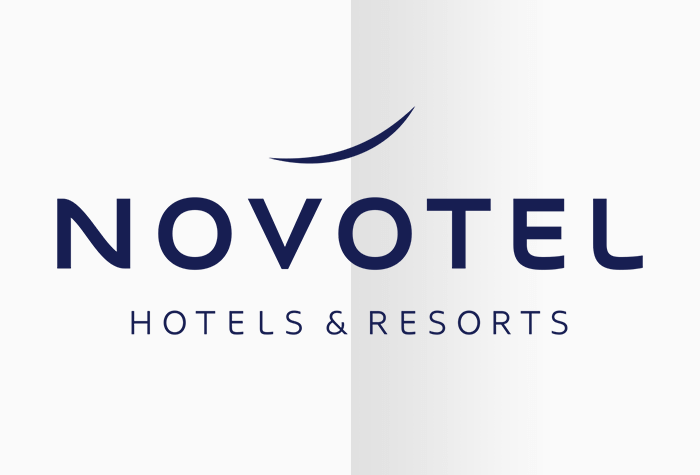 When you one of our Stansted hotels and a parking service together as a package, you'll save yourself the time of hunting for separate deals, and the parking will be heavily subsidised by your overnight stay. In addition, all our packages are covered by our Best Price Guarantee so you can rest assured you won't find the same deal anywhere else for less. We have varying hotel and parking packages available at Stansted, and the different types of parking arrangements will affect your transfers, so we've put together a quick guide on how each type of parking works and how you can get to and from the airport. Each type of parking has different features and benefits to ensure there's something to cater for every agenda and budget. Parking at the hotel - This kind of parking is the best for customers who want their car to stay in the same spot for the duration of their trip. When you arrive at the hotel, simply find a space, and your vehicle will stay there until you arrive to collect it. This kind of package will require you to take a transfer from the hotel - the way this works will vary according to the accommodation you've booked, and may cost extra, so be sure to familiarise yourself with the arrangements. Secured parking - Any package involving 'secured' parking will involve having your car parked for you in a secured car park while you're away. You will need to drive to your chosen hotel and park in the grounds, and then drop your keys off at reception when you check in. One of their fully-insured drivers will park your car whilst you're away, and bring it back to the hotel for you on your return. With this package your transfers to the airport will be to and from the hotel so be sure to familiarise yourself with how the transfers work, and to be aware of any extra costs that may be involved. Parking at the Mid or Long Stay car parks - Some of our hotels at Stansted airport can be booked to include parking at the Mid- or Long-Stay car parks. These are a great option for any customers who are watching the pennies, as both these car parks offer free and frequent transfers to and from the airport. You'll need to drive to your chosen hotel and park overnight during your stay, then on the morning of your flight move your car to the relevant car park. Your car will stay exactly where you park it and on your return simply transfer back from the airport on one of the complimentary shuttles. 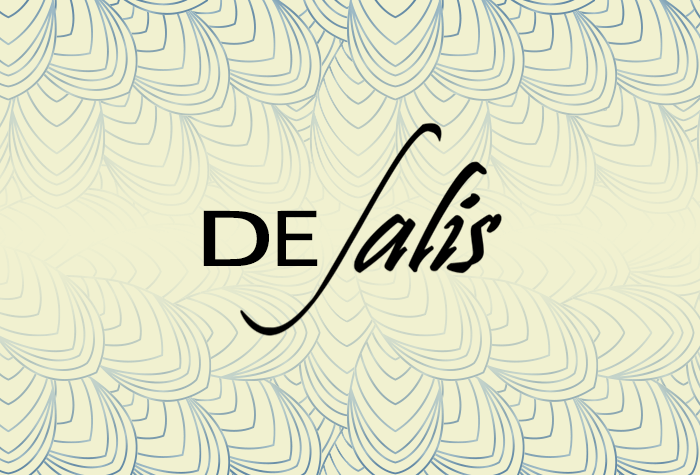 Meet and Greet - For the utmost in convenience, we offer some hotels with Meet and Greet parking. This service works as a valet service - after you've parked at the hotel during your overnight stay, drive to the airport prior to your flight and you'll be met by a uniformed driver. All you'll need to do is hand over your keys and then stroll to check-in as your parking will be taken care of for you - then on your return, it'll be brought back to the airport ready for you to get started on the journey home immediately. Airparks is proud to offer great value airport hotel and parking packages, and with our Best Price Guarantee you can be confident you're getting the best hotel and parking deal around no matter which option you choose. We have plenty of affordable accommodation at Stansted and if you're really watching the pennies, check out our top 5 cheap Stansted Airport hotels. These hotels still offer comfort and convenience; they may just have a slightly longer transfer process or a few less facilities. We have just the thing to make your travels as stress-free as possible... Why not stay the night in a Stansted Airport B&B? 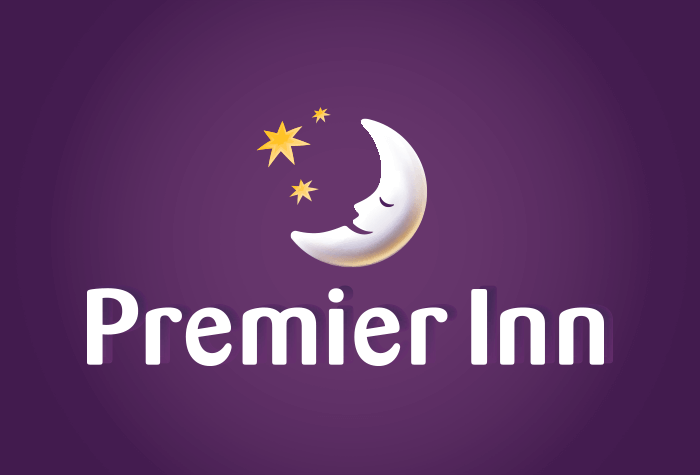 Travelling between Stansted Airport and the surrounding hotels and car parks is quick and simple, but for customers who want to keep their transfer time to the bare minimum - and give themselves more time for a lie in (or breakfast!) 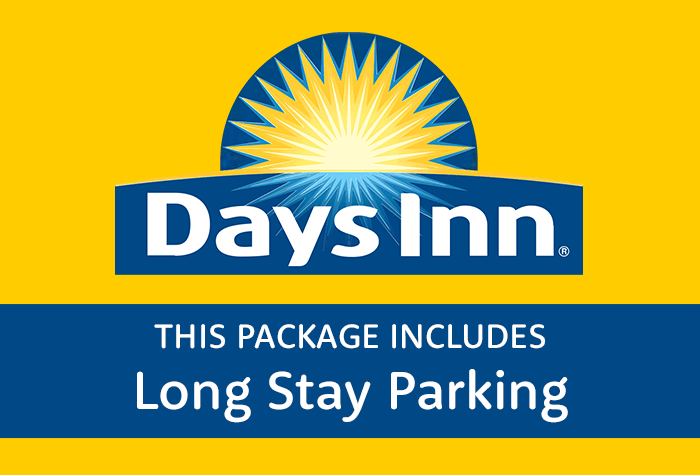 - we've got hotel and parking packages located right on-site at the airport. The Radisson Blu is connected to airport via a covered walkway, making it the number one choice for customers who want to eliminate the need for any transfers. The parking that you can organise alongside is 'secured' parking, meaning you just park within the hotels grounds and leave your keys with reception. A fully-insured chauffeur will park your car in a secured car park while you're away and it'll be waiting for you at the hotel on your return, ready for the journey home. All 3 types of parking that accompany a stay at the Holiday Inn Express make getting to the airport on the morning of your flight a breeze. The hotel is just 10 minutes from the airport - if you opt for a package with parking at the hotel, your car will stay there for the duration and you can take one of the half-hourly buses to the terminal (costing £3 per person each way). 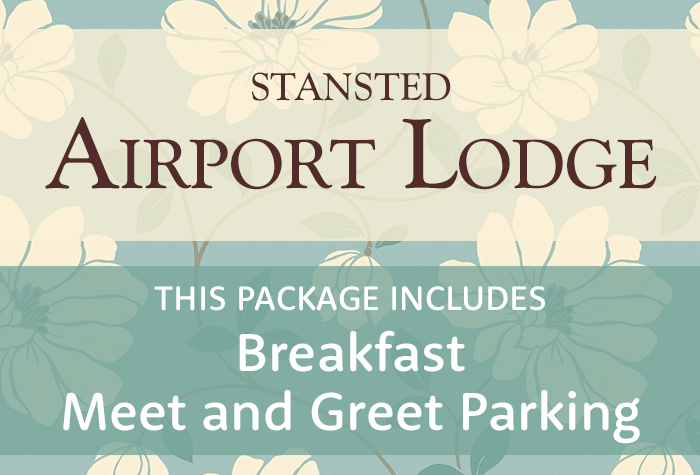 There's also the option to stay at the hotel and park your car in the Stansted Mid Stay car park which is just 5 minutes from the airport via their frequent complimentary transfers - you'll need to park at the hotel during your overnight stay and move your car to the car park in the morning. For the utmost in convenience, you even have the choice to book this hotel with a 'Meet and Greet' service. Again, you'll drive to the hotel and park during your overnight stay first, but in the morning you can drive straight to the airport where you'll be met by a fully-insured driver who will take your keys and park for you while you catch your flight. On your return, your car is brought back to meet you at the airport so you can get started on the journey home. the Radisson Blu is one of the nearest hotels to the airport; just a 5-minute stroll from check-in via an undercover walkway. If this wasn't enough to persuade you to choose this 4-star hotel, there's also an on-site health club with a swimming pool and spa - access is free to all guests - as well as 2 restaurants and a bar. The parking is secured meaning you just need to drive straight to the hotel to park and drop your keys off with reception - your car will be stored in a secured car park for you while you're away and brought back for your return. The Hampton by Hilton is a modern and stylish hotel connected to Stansted Airport by a covered walkway. 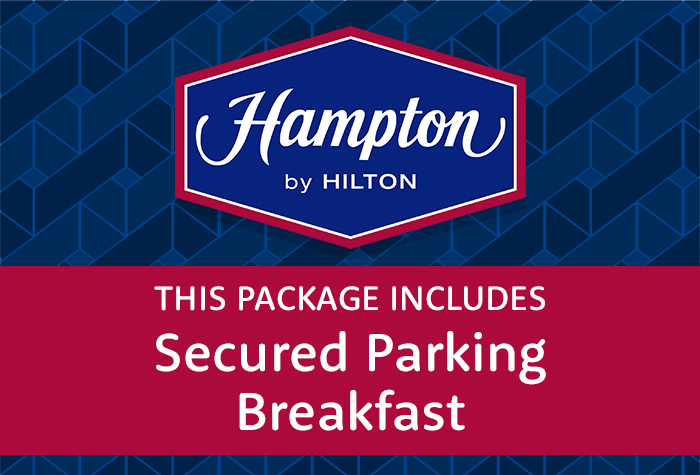 Guests of the Hampton by Hilton can enjoy free WiFi, a free breakfast and access to the 24 hour fitness centre, this hotel is really packed with features to make your stay as comfortable as possible. There's a range of parking options available at the hotel from Meet and Greet to Long Stay parking options so you should have no trouble finding something to suit your needs. 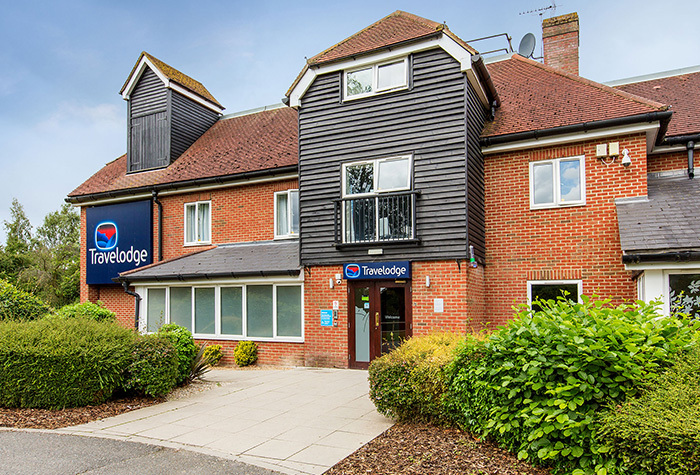 Complete with the familiar comfort of the Holiday Inn Express brand and a free buffet breakfast in the morning, this is one of our most popular hotels in Stansted airport. In addition, you have 3 different parking options when you book the Holiday Inn Express so there's a package to suit everyone. If you choose to park within the hotel grounds just drive straight to the Holiday Inn Express and find a space - your vehicle will stay there for the duration of your trip. 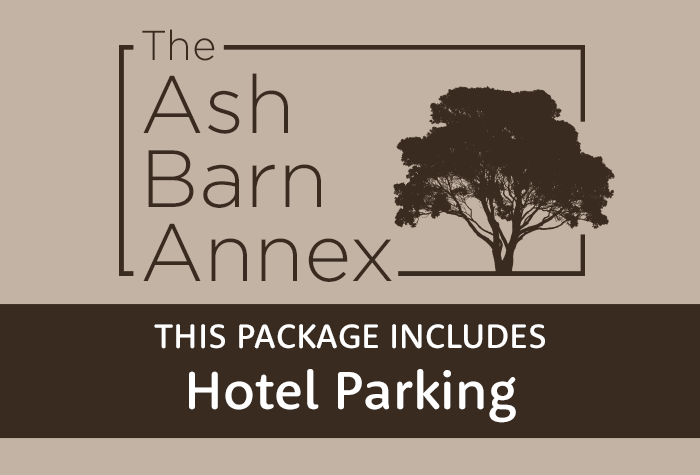 If you opt for a package with parking at the Mid Stay, you'll need to park at the hotel overnight and then drive to the car park in the morning, or for maximum convenience you can book a Meet and Greet service where you're treated to valet style parking. You park at the hotel overnight and then drive to the airport to drop your car off with a fully-insured driver who will park for you. On your return, your car will be waiting for you outside the airport so you can get started on your journey home immediately. 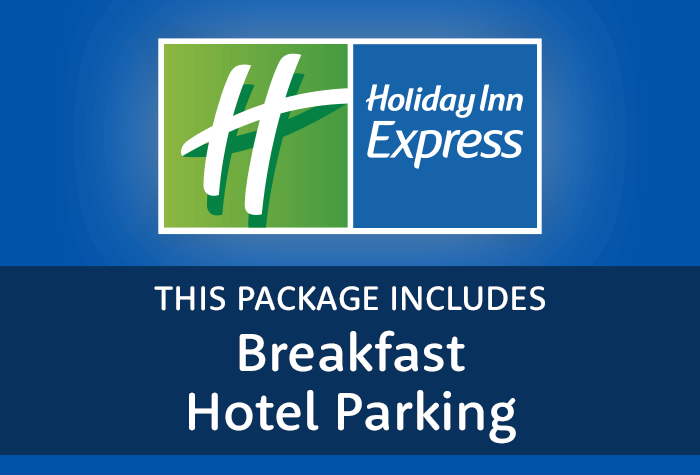 The Holiday Inn Express is a particular favourite with our customers as you can get a free buffet breakfast. In addition, when you book in advance with Airparks you'll have the option to add a 2-course meal at their Rotisserie restaurant to your booking for just £20 a head, saving you up to £4.95. 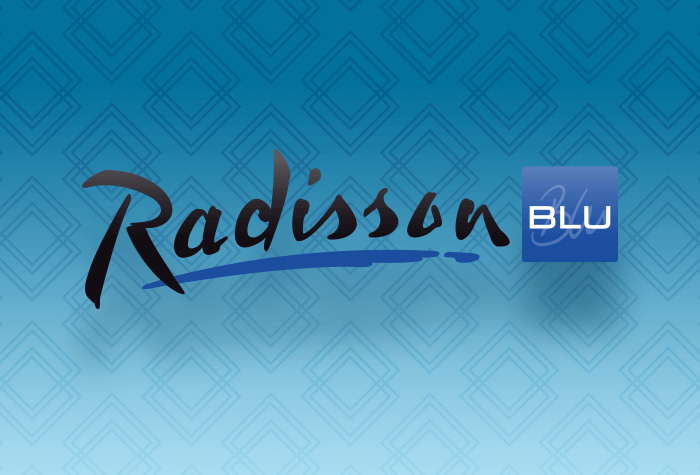 Save 44% on a breakfast buffet at the Radisson Blu by adding it on to your reservation - it's just £9.95 per person. 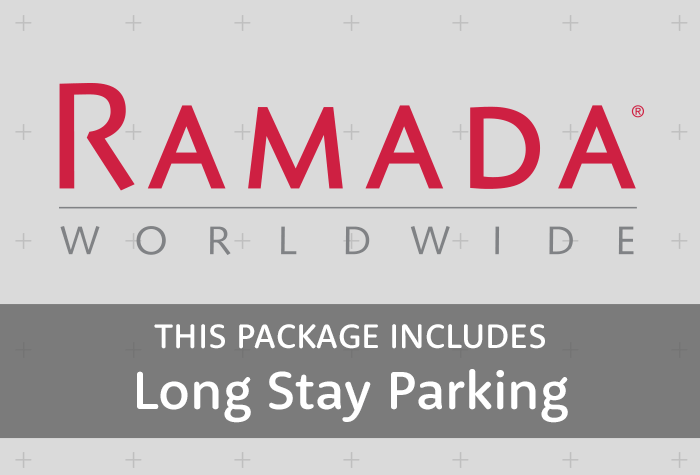 There are plenty of savings to be made when you add a meal to your stay at the Ramada. The hotel puts on a huge buffet breakfast every morning - there are cooked and continental choices - all for just £9.95 through Airparks, or for the same price you can pick up a breakfast box from 4AM - perfect if you've got an early flight. For customers who fancy an evening meal, you can pre-book a 2-course dinner at the Junction restaurant for just £16 a head and enjoy a range of foods from burgers to fresh pasta and more.